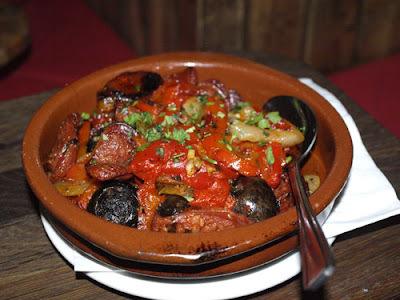 I was so pleased to be invited back to La Tasca in Renfield Street Glasgow. 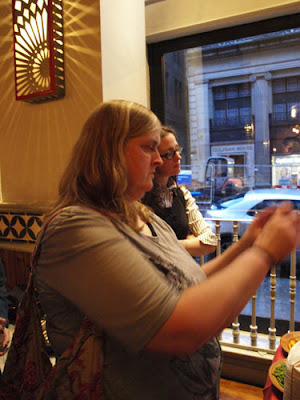 I was last there in March and enjoyed tasting the tapas and meeting up with other Scottish food bloggers, you can read about it here. 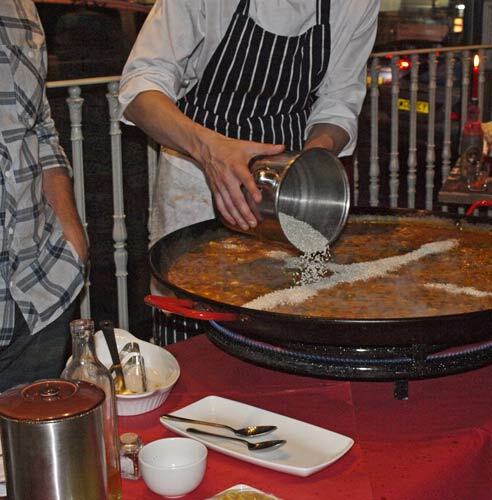 This time I was invited to a Paella evening and to try the new autumn menu dishes. When we arrived there was the opportunity to try some of wines on offer at La Tasca, to accompany the wine we had jamon, anchovies and Manchego cheese. The cheese was particularly good. 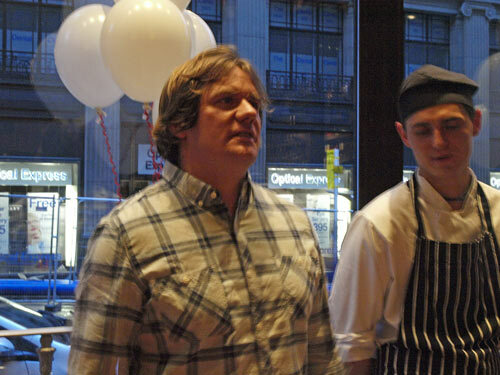 Our host for the evening was Executive Chef Antiono Bennetto. Antiono started his career in restaurants and hotel kitchens, but soon moved to food development, working for food producers and supermarkets, he then moved into development for big brand restaurants. Antonio travels frequently to Spain to meet local chefs and find out as much as possible about the traditional dishes and techniques of Spanish cookery. His most recent visits have been to Valencia to research paella. Paella from Valencia traditionally contains rabbit and snails, and the paella would also be cooked in a very thin layer without much fish or meat. However, Antonio's job is to take traditional dishes and adapt them for mainstream British tastes. It was interesting to hear that, while 'bone in' chicken thighs would have more taste, they are higher in fat, so chicken breast is used. 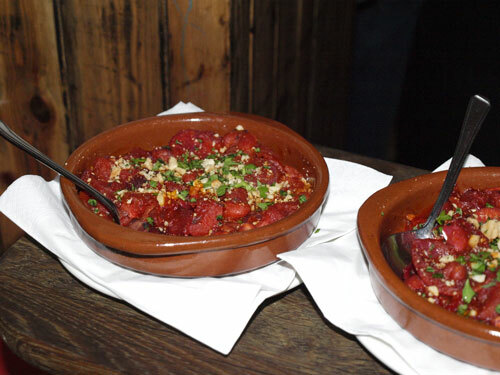 La Tasca also have their own recipe chorizo which is made in Spain for them and contains less fat and less salt than the traditional recipe. I had so many photographs of the paella making that I decided to make a digital layout of the process. It was interesting to see the way the paella was made, the chicken, squid and prawns were all added before the rice and yet they did not seem to suffer from a longer cooking. The correct type of rice is very important, La Tasca use Bomba rice, which absorbs three times the quantity of liquid as compared to twice the liquid for most other rice varieties. I loved the way the rice was added to pan in a cross then Thomas, the chef, drew the rice into the stock evenly using the quadrants to guide him. This ensured that the rice was distributed evenly which is very important because we then learned that you do not stir paella! While the paella was cooking it was time to taste the new dishes on the autumn menu. I'm hoping that I have got them right, apologies if I have mis-named them. Spanish black pudding and chorizo cooked with fire roast peppers, basil and onion. This was probably my favourite of the new dishes, at first I thought 'what big olives'! However when I bit into the firm, slightly rubbery skin, I was delighted to find a soft and succulent mouthful of black pudding. A mild, rather than spicy mixture, much softer then the Scottish kind of black pudding. The combination with the chorizo, onions and peppers really worked well. Two fresh mini home-made beef burgers with all the Spanish toppings. The mini burgers really did taste homemade, no taste of fillers. The caramelised onions were soft and full of flavour and the little buns were reminiscent of brioche. 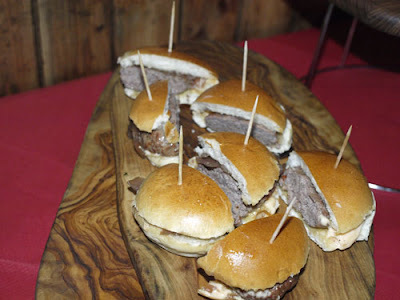 I wouldn't have ordered burgers in a tapas bar but they were very good and a nice addition to the menu for conservative eaters and children. Butternut squash, red onion, chickpeas, celeriac and cannellini beans in a winter warming spicy tomato sauce topped with crushed almonds and parsley. This is a new vegetarian option at La Tasca, I can't say that it jumped out at me as a highlight of the meal, it seemed to blend in with the other tomato based dishes. Hand-crumbed with three-month-aged-Manchego cheese and fresh spinach, served with roasted garlic mayonnaise. The Croquetas de Manchego did not disappoint, lovely crunchy outside and soft cheesy inside, these are a must have on any tapas table. Amazing Spanish take on egg and chips, needs to be cut before eating. Somehow I missed this dish, so am not able to comment on it, I did see someone eating it and they seemed to be enjoying it! Sadly my rural location (last train at 8.10pm) meant that I had to leave before the paella was ready to taste, so I have had to rely on my bloggie friends to tell me just how good it was! It was good to meet Elaine from Fun as a Gran and Graham from A Scots Larder. Special thanks to Briony from The Glasgow Food Blog for sharing her photographs. I was gutted that I didn't get to try the paella, I think I will have to make a trip to La Tasca just to have some, especially as the reports I got were that the flavour was incredible. Many thanks to Ella for inviting me to La Tasca and also for the goodie bag. I love paella so would have loved to have joined you too. 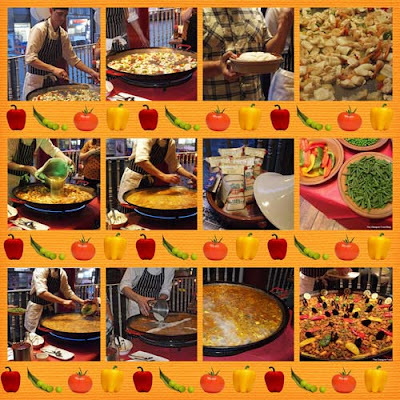 Love your layout of photos for the paella making! Looks really good! 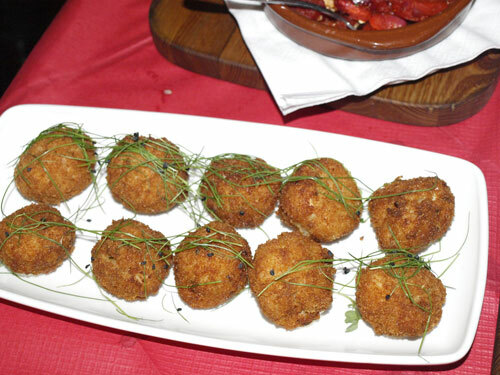 Especially loved the sound f the cheese and spinach croquettes. Are you going to try making paella at home? I have to confess that La Tasca in Aberdeen is not somewhere that I've been in a very long time. Perhaps they shoud do an event for Aberdeen food bloggers?! Thank you. I have bought some paella rice so will be giving it a go. I would ask them if they will run an event for you in Aberdeen, worth a try. 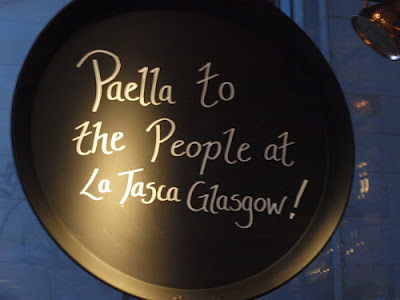 Looks great and very jealous, will have to visit La Tasca next time I'm in Aberdeen. Thanks for the lovely comments, were so glad you had a good time and are so interested in what La Tasca offers :) The pictures look great by the way. We will be sure to keep you updated with future events as well!